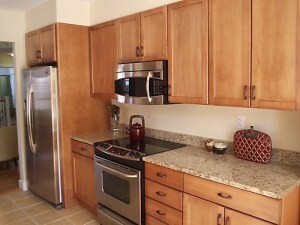 Having a galley kitchen does not mean that you need to sacrifice style, efficiency or dreams of gourmet bliss. While a galley kitchen can be short on space, when laid out correctly it can meet all of your needs and exceed expectations. Because a galley kitchen is small on space, using high end products can be accomplished at a smaller price than a larger kitchen. Always dreamt of a farm style sink but never thought it was something you could fit into your budget?? Having a galley kitchen with a smaller space to update might be the key to your dream sink, backsplash and tiles. The triangle (fridge, sink and range) is the most important factor in any kitchen, but more so in the galley style. To maximize space a great trick is to use a microwave on top of the range instead of the typical hood which can be aesthetically pleasing but not a necessity when a microwave can double as a hood. The ideal triangle will place the range and fridge on one wall with the sink being on the opposite wall. Another way to “add” space is to choose a full range instead of a cooktop and wall ovens. In a galley kitchen having “zones” for prep, cleaning and cooking will change the functionality and efficiency of your tight space. Having your prep and cooking area close to each other will cut back on the amount of time that you are moving about in a tight space. Storage in any space is key but more so in a kitchen where gadgets can number high. A trick to expanding space is to have cabinets that reach to the ceiling so that there is no wasted space. Keeping clutter to a minimum in a galley kitchen will also ensure that the space looks its largest and functions at its highest capacity. Choosing sleek cabinets with simple lines will also make the area appear to be larger than it is, increasing the efficiency in the space. Like any room choosing the right color and accessorizes can make or break your space, the kitchen is no exception. 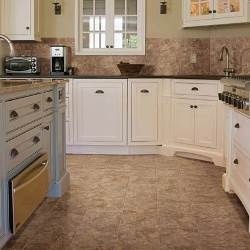 Choosing a lighter or even brighter color tile will allow for the space to appear larger than it actually might be. Accessories in a galley kitchen should be kept to a minimum to increase the efficiency and function of the tight space. Yoour style is so unique compared to other people I have reaad stuyff from. Thanks! I hope you continue to enjoy our blogs!